Different patterns of malignant change occur in pleomorphic adenoma, of which carcinoma ex pleomorphic adenoma is one form; the other 2 forms are true malignant mixed tumor (carcinosarcoma) and metastasizing pleomorphic adenoma. 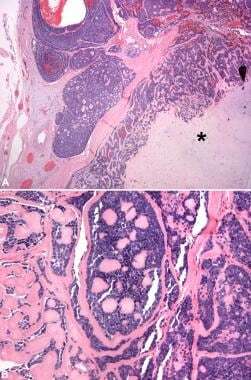 Among these types of adenoma, carcinoma ex pleomorphic adenoma is the most commonly encountered; it was first described by Beahrs et al in 1957. It is defined as a carcinoma that arises in the epithelial and/or myoepithelial component of a pleomorphic adenoma. In most instances (75%), the luminal epithelial cells undergo malignant change. In 19% of cases, a dual epithelial/myoepithelial differentiated carcinoma is seen. Pure myoepithelial malignant change is seen in only 6% of cases. Interestingly, the rate of occurrence seems to increase with increases in the period during which pleomorphic adenoma is left untreated. According to some investigators, the rate of malignant change is 1.5% in the first year in which the adenoma goes untreated; it increases to 9.5% after 15 years. Carcinoma ex pleomorphic adenoma more commonly occurs in the major salivary glands than in the minor salivary glands. Fine-needle aspiration is generally one of the first steps taken in diagnosing a salivary gland mass. It is interesting to note that carcinoma ex pleomorphic adenoma tends to occur in the deep lobe of the parotid, in contrast to most pleomorphic adenomas, which tend to occur in the superficial lobe. This fact may account for the low preoperative diagnostic accuracy and sensitivity of fine-needle aspiration in diagnosing carcinoma ex pleomorphic adenoma. Carcinoma ex pleomorphic adenomas vary considerably in size; sizes may range from 1 cm to greater than 20 cm. Macroscopic features that suggest malignant transformation in pleomorphic adenoma include poorly defined and/or infiltrative tumor margins,  the presence of foci of hemorrhage, and necrosis. However, some malignant tumors are well circumscribed [19, 26] (eg, noninvasive or minimally invasive varieties). Undifferentiated carcinoma ex pleomorphic adenoma. Image A: In the right upper side of the photomicrograph, an undifferentiated carcinoma is seen infiltrating into the benign pleomorphic adenoma component, which appears on the left side of the photomicrograph. Image B: At higher magnification, the undifferentiated carcinoma shows pleomorphic tumor cells with focally vacuolated cytoplasm. A dark, star-shaped mitotic figure is readily apparent in the middle of the photomicrograph. Salivary duct carcinoma ex pleomorphic adenoma. 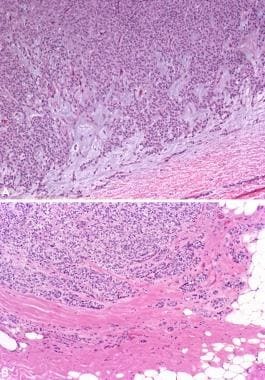 Image A: The malignant portion of the tumor is shown with the characteristic cribriform pattern and central comedo necrosis—characteristics usually seen in salivary duct carcinoma. Image B: The right side of the image shows a benign pleomorphic adenoma. Note the metastatic tumor emboli from the malignant component seen in Image A in the peritumoral vessels (arrows). Adenoid cystic carcinoma ex pleomorphic adenoma. Image A: Adenoid cystic carcinoma surrounds and infiltrates the chondroid stroma (asterisk sign) of the adjacent benign pleomorphic adenoma. Note that the tumor appears to still be within the confines of the original tumor fibrous capsule surrounding the circumference. 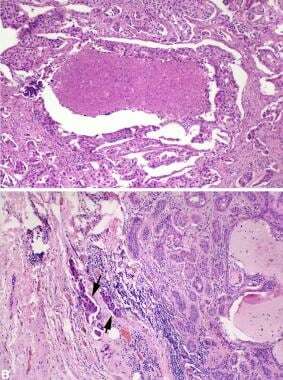 Image B: At higher magnification, the characteristic cribriform (Swiss cheese) pattern of adenoid cystic carcinoma with intervening reduplicated and hyalinized basal lamina is apparent. Myoepithelial carcinoma ex pleomorphic adenoma. Image A: The tumor is infiltrating the myxoid stroma of pleomorphic adenoma and almost completely replaces the substance of the benign tumor. Note the bland nature of the tumor cells in this malignancy; this may cause difficulties in recognizing malignancy in small tissue biopsy specimens, particularly in light of the fact that myoepithelial cells are a constituent of pleomorphic adenoma cell populations. Image B: The malignant nature of the tumor is obvious in this image. Note how the tumor extends into the surrounding tissue, infiltrating it in cords and in single cell files. Tumors that invade beyond the capsule into the surrounding tissue by less than 1.5 cm are considered minimally invasive; overall, patients with this form of disease have an excellent prognosis. Those tumors that invade beyond 1.5 cm are considered invasive; with such tumors, prognoses vary in accordance with tumor stage and grade. Tumors should be carefully evaluated with regard to the degree of invasion of tumor, because treatment will vary accordingly. The grade of the cells seen in the cancerous epithelial component varies from well differentiated to poorly differentiated to anaplastic, depending on the cancerous subtype. Most carcinomas are high grade, but some are low grade. However, the histologic grades of the tumor should be judged according to how the carcinomatous category is usually graded in an individual tumor. For example, a mucoepidermoid carcinoma ex pleomorphic adenoma is histologically categorized as being of low, intermediate, or high grade histologically, as is done in the case of a mucoepidermoid carcinoma occurring as an individual tumor. Perineural invasion  and angiovascular invasion are commonly encountered in the invasive types; necrosis is prominent in the high-grade types. Determining the different types of cells in the tumor by use of immunohistochemistry may aid in establishing an accurate diagnosis Tumor markers are described in the Medscape Reference article Pathology of Pleomorphic Adenoma. However, specific additional markers have occasionally proven useful in cases of carcinoma ex pleomorphic adenoma. Immunoreactivity for p53 was observed by some authors to be a useful tool in differentiating pleomorphic adenoma from carcinoma ex pleomorphic adenoma. Indeed, some authors have reported that p53 may be used as a means of early detection of malignant change in pleomorphic adenoma [36, 37, 38, 31, 39] ; other authors, however, have disputed this claim. Recently, expression of X-linked inhibitor of apoptosis protein (XIAP) (a protein that is associated with aggressive behavior in tumors) was studied in both pleomorphic adenoma and carcinoma ex pleomorphic adenoma. The results indicated an increase in the expression of XIAP from pleomorphic adenoma to cellular pleomorphic adenoma to carcinoma ex pleomorphic adenoma, or even atypical areas within pleomorphic adenoma. Such findings suggest that XIAP expression may be an additional marker to aid in the evaluation of malignant change in pleomorphic adenoma. Deletions of chromosome 5 have been reported, as have alterations in chromosome 17q and 6q deletion. For carcinoma ex pleomorphic adenoma arising in the minor salivary glands, staging is determined in accordance with the system of the region of occurrence. Patients with noninvasive and minimally invasive tumors have an excellent prognosis; for these tumors, the metastatic potential is very low. [50, 34] Tumors in the invasive category tend to behave in a more aggressive fashion; up to 25-50% of patients experience recurrence, [3, 7, 19] and up to 60-70% of patients develop local or distant metastasis. Metastatic sites include lymph nodes, bone (especially vertebral bodies), and the brain. The stage of the disease plays an important role in prognosis. Patients with stage I disease generally have an excellent prognosis, whereas the survival rate for patients with stage IV disease is extremely poor. A recent study of 22 patients with CXPA confirmed this general tendency. In that study, both the 5-year disease-specific and overall survival rates were 60%; the recurrence-free survival rate after 5 years was 85%. Interestingly, in this series, the incidence of higher-stage disease correlated with older age (the average age of patients with stage IV disease was 67 years), whereas lower-stage disease correlated with younger age (the average age of patients with stage I or II disease was 53 years). Said-Al-Naief N, Moran C, Luna M. Sarcoma ex-pleomorphic adenoma: a case report of unique entity. Oral Surg Oral Med Oral Pathol Oral Radiol Endod. 2007. 103(4):e28-e29. Beahrs OH, Woolner LB, Kirklin JW, Devine KD. Carcinomatous transformation of mixed tumors of the parotid gland. ALH. AMA Arch Surg. 1957 Oct. 75(4):605-13; discussion 613-4. [Medline]. Gnepp DR, Wenig BM. malignant mixed tumors. Ellis GL, Auclair PL, Gnepp DR. Surgical pathology of salivary the glands. Philadelphia: Saunders; 1991. 350-368. Chaudhry AP, Vickers RA, Gorlin RJ. Intraoral minor salivary gland tumors. An analysis of 1,414 cases. Oral Surg Oral Med Oral Pathol. 1961 Oct. 14:1194-226. [Medline]. Kane WJ, McCaffrey TV, Olsen KD, Lewis JE. Primary parotid malignancies. A clinical and pathologic review. Arch Otolaryngol Head Neck Surg. 1991 Mar. 117(3):307-15. [Medline]. Olsen KD, Lewis JE. Carcinoma ex pleomorphic adenoma: a clinicopathologic review. Head Neck. 2001 Sep. 23(9):705-12. [Medline]. Zbaren P, Zbaren S, Caversaccio MD, Stauffer E. Carcinoma ex pleomorphic adenoma: diagnostic difficulty and outcome. Otolaryngol Head Neck Surg. 2008 May. 138(5):601-605. Krolls SO, Trodahl JN, Boyers RC. Salivary gland lesions in children. A survey of 430 cases. Cancer. 1972 Aug. 30(2):459-69. [Medline]. Lack EE, Upton MP. Histopathologic review of salivary gland tumors in childhood. Arch Otolaryngol Head Neck Surg. 1988 Aug. 114(8):898-906. [Medline]. Spiro RH, Huvos AG, Strong EW. Malignant mixed tumor of salivary origin: a clinicopathologic study of 146 cases. Cancer. 1977 Feb. 39(2):388-96. [Medline]. Eneroth CM, Zetterberg A. Malignancy in pleomorphic adenoma. A clinical and microspectrophotometric study. Acta Otolaryngol. 1974 Jun. 77(6):426-32. [Medline]. Hu YH, Zhang CY, Tian Z, Wang LZ, Li J. Aberrant Protein Expression and Promoter Methylation of p16 Gene Are Correlated With Malignant Transformation of Salivary Pleomorphic Adenoma. Arch Pathol Lab Med. 2011 Jul. 135(7):882-9. [Medline]. Beckhardt RN, Weber RS, Zane R, et al. Minor salivary gland tumors of the palate: clinical and pathologic correlates of outcome. Laryngoscope. 1995 Nov. 105(11):1155-60. [Medline]. Furukawa M, Suzuki H, Matsuura K, Takahashi E, Suzuki H, Tezuka F. Carcinoma ex pleomorphic adenoma of the palatal minor salivary gland with extension into the nasopharynx. Auris Nasus Larynx. 2001 Aug. 28(3):279-81. [Medline]. Waldron CA, el-Mofty SK, Gnepp DR. Tumors of the intraoral minor salivary glands: a demographic and histologic study of 426 cases. Oral Surg Oral Med Oral Pathol. 1988 Sep. 66(3):323-33. [Medline]. Neely MM, Rohrer MD, Young SK. Tumors of minor salivary glands and the analysis of 106 cases. J Okla Dent Assoc. 1996 Spring. 86(4):50-2. [Medline]. LiVolsi VA, Perzin KH. Malignant mixed tumors arising in salivary glands. I. Carcinomas arising in benign mixed tumors: a clinicopathologic study. Cancer. 1977 May. 39(5):2209-30. [Medline]. Luna MA, Stimson PG, Bardwil JM. Minor salivary gland tumors of the oral cavity. A review of sixty-eight cases. Oral Surg Oral Med Oral Pathol. 1968 Jan. 25(1):71-86. [Medline]. Seifert G, Mehlkle A, Haubrich J, Chilla R. Diseases of the Salivary Glands: Diagnosis, Treatment, Facial Nerve Surgery. Stuttgart: Georg Theime Verlag; 1986. 222-81. Luers JC, Wittekindt C, Streppel M, Guntinas-Lichius O. Carcinoma ex pleomorphic adenoma of the parotid gland. Study and implications for diagnostics and therapy. Acta Oncol. 2009. 48(1):132-6. [Medline]. Chen AM, Garcia J, Bucci MK, Quivey JM, Eisele DW. The role of postoperative radiation therapy in carcinoma ex pleomorphic adenoma of the parotid gland. Int J Radiat Oncol Biol Phys. 2007 Jan 1. 67(1):138-43. [Medline]. Nouraei SA, Hope KL, Kelly CG, McLean NR, Soames JV. Carcinoma ex benign pleomorphic adenoma of the parotid gland. Plast Reconstr Surg. 2005 Oct. 116(5):1206-13. [Medline]. Nagao K, Matsuzaki O, Saiga H, et al. 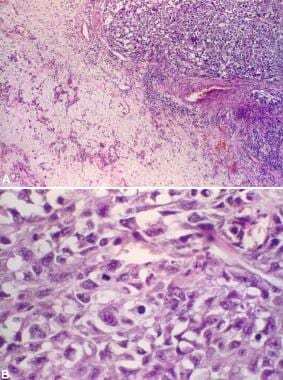 Histopathologic studies on carcinoma in pleomorphic adenoma of the parotid gland. Cancer. 1981 Jul 1. 48(1):113-21. [Medline]. Tortoledo ME, Luna MA, Batsakis JG. Carcinomas ex pleomorphic adenoma and malignant mixed tumors. Histomorphologic indexes. Arch Otolaryngol. 1984 Mar. 110(3):172-6. [Medline]. Gnepp DR, Brandwein-Gensler MS, El-naggar AK, Nagao T. Carcinoma ex pleomorphic adenoma. Barnes L, Eveson JW, Reichart P, et al, eds. Pathology and Genetics Head and Neck Tumors. Lyon, France: IARC Press; 2005. 242-243. Toluie S, Thompson LD. Sinonasal tract adenoid cystic carcinoma ex-pleomorphic adenoma: a clinicopathologic and immunophenotypic study of 9 cases combined with a comprehensive review of the literature. Head Neck Pathol. 2012 Dec. 6(4):409-21. [Medline]. [Full Text]. Lewis JE, McKinney BC, Weiland LH, Ferreiro JA, Olsen KD. Salivary duct carcinoma. Clinicopathologic and immunohistochemical review of 26 cases. Cancer. 1996 Jan 15. 77(2):223-30. [Medline]. Ihrler S, Weiler C, Hirschmann A, et al. Intraductal carcinoma is the precursor of carcinoma ex pleomorphic adenoma and is often associated with dysfunctional p53. Histopathology. 2007 Sep. 51(3):362-71. [Medline]. Altemani A, Martins MT, Freitas L, Soares F, Araujo NS, Araujo VC. Carcinoma ex pleomorphic adenoma (CXPA): immunoprofile of the cells involved in carcinomatous progression. Histopathology. 2005 Jun. 46(6):635-41. [Medline]. Brandwein M, Huvos AG, Dardick I, Thomas MJ, Theise ND. Noninvasive and minimally invasive carcinoma ex mixed tumor: a clinicopathologic and ploidy study of 12 patients with major salivary tumors of low (or no?) malignant potential. Oral Surg Oral Med Oral Pathol Oral Radiol Endod. 1996 Jun. 81(6):655-64. [Medline]. Sedassari BT, Rodrigues MF, Mariano FV, Altemani A, Nunes FD, Sousa S. The Stem Cell Marker Bmi-1 Is Sensitive in Identifying Early Lesions of Carcinoma ex Pleomorphic Adenoma. Medicine (Baltimore). 2015 Jul. 94 (27):e1035. [Medline]. Deguchi H, Hamano H, Hayashi Y. c-myc, ras p21 and p53 expression in pleomorphic adenoma and its malignant form of the human salivary glands. Acta Pathol Jpn. 1993 Jul-Aug. 43(7-8):413-22. [Medline]. Righi PD, Li YQ, Deutsch M, et al. The role of the p53 gene in the malignant transformation of pleomorphic adenomas of the parotid gland. Anticancer Res. 1994 Sep-Oct. 14(5B):2253-7. [Medline]. Ohtaké S, Cheng J, Ida H, et al. Precancerous foci in pleomorphic adenoma of the salivary gland: recognition of focal carcinoma and atypical tumor cells by P53 immunohistochemistry. J Oral Pathol Med. 2002 Nov. 31(10):590-7. [Medline]. Freitas LL, Araujo VC, Martins MT, Chone C, Crespo A, Altemani A. Biomarker analysis in carcinoma ex pleomorphic adenoma at an early phase of carcinomatous transformation. Int J Surg Pathol. 2005 Oct. 13(4):337-42. [Medline]. Lewis JE, Olsen KD, Sebo TJ. Carcinoma ex pleomorphic adenoma: pathologic analysis of 73 cases. Hum Pathol. 2001 Jun. 32(6):596-604. [Medline]. Sugano S, Mukai K, Tsuda H, et al. Immunohistochemical study of c-erbB-2 oncoprotein overexpression in human major salivary gland carcinoma: an indicator of aggressiveness. Laryngoscope. 1992 Aug. 102(8):923-7. [Medline]. Rosa JC, Fonseca I, Félix A, Soares J. Immunohistochemical study of c-erbB-2 expression in carcinoma ex-pleomorphic adenoma. Histopathology. 1996 Mar. 28(3):247-52. [Medline]. Patel RS, Hughes CW, Fredericks S, et al. Cyclin A expression and its diagnostic value in pleomorphic adenoma and carcinoma expleomorphic adenoma of the parotid gland. Histopathology. 2007 Jul. 51(1):21-5. [Medline]. Zhu X, Zhang J, Chen X, Feng X. Comparison of Ki-67, cyclin E, and p63 in benign and malignant human pleomorphic adenoma. Oral Surg Oral Med Oral Pathol Oral Radiol. 2012 May. 113(5):667-72. [Medline]. Hoch BL, Wu M, Lewis M, Gan L, Burstein DE. An immunohistochemical study of XIAP expression in pleomorphic adenoma and carcinoma ex pleomorphic adenoma. J Oral Pathol Med. 2008 Nov. 37(10):634-8. [Medline]. Rao PH, Murty VV, Louie DC, Chaganti RS. Nonsyntenic amplification of MYC with CDK4 and MDM2 in a malignant mixed tumor of salivary gland. Cancer Genet Cytogenet. 1998 Sep. 105(2):160-3. [Medline]. Persson F, Andren Y, Winnes M, et al. High-resolution genomic profiling of adenomas and carcinomas of the salivary glands reveals amplification, rearrangement, and fusion of HMGA2. Genes Chromosomes Cancer. 2009 Jan. 48(1):69-82. [Medline]. Tarakji B, Baroudi K, Hanouneh S, Nassani MZ, Alotaibi AM, Kharma MY, et al. Expression of p21 is dependent on or independent of p53 in carcinoma ex pleomorphic adenoma (undifferentiated and adenocarcinoma types). Pol J Pathol. 2012 Dec. 63(4):286-91. [Medline]. American Joint Committee on Cancer. Major salivary glands. Greene FL, Page DL, Fleming ID, et al, eds. AJCC Cancer Staging Manual. 6th ed. New York: Springer-Verlag; 2002. 69-75. Felix A, Rosa-Santos J, Mendonca ME, Torrinha F, Soares J. Intracapsular carcinoma ex pleomorphic adenoma. Report of a case with unusual metastatic behaviour. Oral Oncol. 2002 Jan. 38(1):107-10. [Medline].